I am more than just a music fan. I am a "collector" -- at least, that is what i tell myself in order to justify my CD purhcasing "habit". A few weeks ago i found a person online who was getting rid of a copy of High Ball Me by Moose. Moose opened for Cocteau Twins in 1994, and i have been searching for their exceedingly rare catalog after seeing them on that tour. When the package arrived there were 2 CD's. This was the other. I wrote the individual in question to see if this was sent by mistake. "No," came the reply. "That's me and my friend." Which, i have to admit, could be scary. What type of music could this individual perform? Dreading some sort of Dave Matthews-esque jam band, i plugged it in. And immediately thought, what was i worried about? The return address plainly indicated suburban Toronto, home of the contemporary space rock zeitgeist. This band exist alongside Datura Dream Deferred, SIANspheric, Mean Red Spiders, South Pacific, etc. Well, actually they are a little more electronic than those guitar bands. Maybe that makes it "space electronica"? "Space IDM"? (No, it's not glitchy.) What this reminds me of is the stuff i got into electronica for in the first place -- early Orb, Spacetime Continuum, the Excursions in Ambience series on Astralwerks.... This is really cool ambient dubby deep listening music. It is also self-released. You can order a copy from the band by contacting them at their MP3.com site. If you like music of the type i just mentioned, then this is totally worth checking out. It is dark music that wanders around under beeping keys and slow deep bass hits. It is like the soundtrack to a dark sci-fi film, where the aliens are slowly killing everyone abord the spaceship, but no one quite realizes what's happening. Personally, i like that kind of stuff. I know that not everyone does, but if you do, then go ahead and check out Hypnotech 3's MP3.com site. There are several tracks, including some of the ones on this EP, on the site. Hey -- it's worth a listen at the very least. And who knows, you might like it. Anyway, one more thing before i discuss the songs, and that is the use of the term "EP". There are 5 tracks on my CD, and 4 listed as being on the EP at the website. My CD clocks in at 50:57. Take away that fifth "bonus" track and this thing is 44:01 long. For an EP, that is quite extensive. 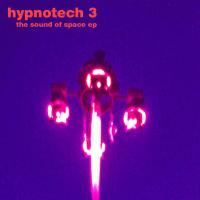 But anyway, Hypnotech 3 consider this an EP. I wonder why? The EP starts off with the aptly named Ambient Space Manoeuvre. This song builds slowly out of bleeps and blips -- not glitchy blips, but more like a computer taking it's time counting 1's and 0's. Slow bass hits wander by. Less Autechre more Spacetime Contimuum. Things build and flow right into Nine Seconds Of Light, which is a lovely 11 minute song. It is a long dreamy sequence of half heard guitar noise and quiet keyboard tones. It ends with a squeal of sound waves slowly bent and twisted. Granted, i was playing the EP at a high enough volume that i could sit at the dining room table and hear the music from the stereo in the living room (maybe 8 feet away), so maybe that had something to do with it. At any rate, these 2 tones sort of stand out. Between the bent sound that closes out Nine Seconds Of Light to these sounds, Stella Maris Space Station is obviously NOT the place to be. It's just ... uneasy. Not disturbing like the Labradford droid torturing, but just kind of "not right". I cannot quite put my finger on it any more than that, sorry. Some darker mood is successfully portrayed by the music at the very least. That is the end of the EP if we are to believe what is posted on MP3.com. However, my CD contains one more track. A track which, unexpectedly, rocks! Well, it rocks in a slow, spaced out kind of way. But there is real drumming, throbbing bass, and a great little keyboard melody that drives the tune along. This track is called The Rebels Are Not Forgotten, and it is also available on MP3.com if you are curious. On the whole, i am impressed. Certainly a fine CD for the price! Seriously though -- if you enjoy ambient electronica from circa 1993, or if you want to move on past your Pink Floyd records, or if you want something new to sit and just listen to as you write your Sci-Fi epic 7 part novel, this is a great disc to try out.